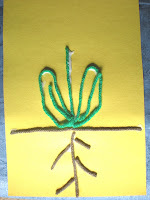 One of the aspects we discuss with the children during our planting and flower unit is the parts of a flower. I keep it very basic. We discuss the roots that help the flower get it's nutrients to grow. The stem that holds the flower tall, with the leaves coming from the stem. Then the colorful flower with it's petals. In class we have a project we do to emphasize these parts with different colors. I was trying to think of something a little more crafty or creative. I came up with making flowers from yarn. My youngest and I did the project. It was a bit sticky and he had some frustration with cutting the yarn to the correct size. I told him just to lay the yarn on the area he wanted it to be and I trimmed the extra. I took a piece of 9x12 construction paper and cut it in half. I than cut some yarn into different pieces. I had different colors for different parts of the flower. I let him draw the ground with the glue first and we put a piece of yarn across to symbolize the ground. 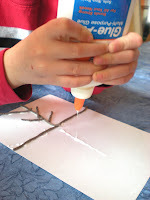 The first part he drew with the glue was the roots. 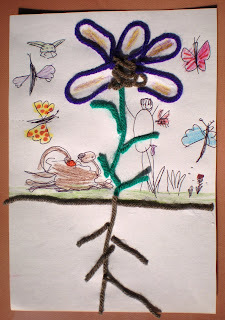 After they were drawn he put brown yarn on top of the glue. Next came the stem and leaves; his leaves were straight, you can see I added some flair to mine. The final part was the flower. He started the flower than asked me to finish drawing the petals with the glue as he didn't like how they looked. I thought they came out pretty cute. He decorated his after it was finished to personalize it some more. 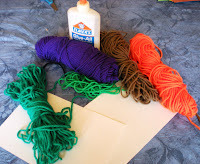 If you have some yarn lying around, maybe you want to give it a try. This is a wonderful project! Thanks so much for the idea. I can't wait to try it with my little ones! I really like this craft project. We will have to try this in our home. Thanks for sharing! !